We received this Sonoma Valley (always have fond memories writing these words) Merlot as a gift for our annual Cinco de Mayo celebration, and decided to break it out Friday night with dinner. While the mushrooms simmered and the spicy beef ravioli were cooking, the full berrysmell of this satisfying Merlot wafted around the kitchen. Five Oaks Merlot, Gallo Family Vineyards, Sonoma Valley, California, USA. It’s been forever, as you’ll note if you scroll through the archives here, since we’ve actually uncorked a Merlot. It’s always been more of a winter comfort, but this cold season I was definitely into Bordeaux and Pinot instead. 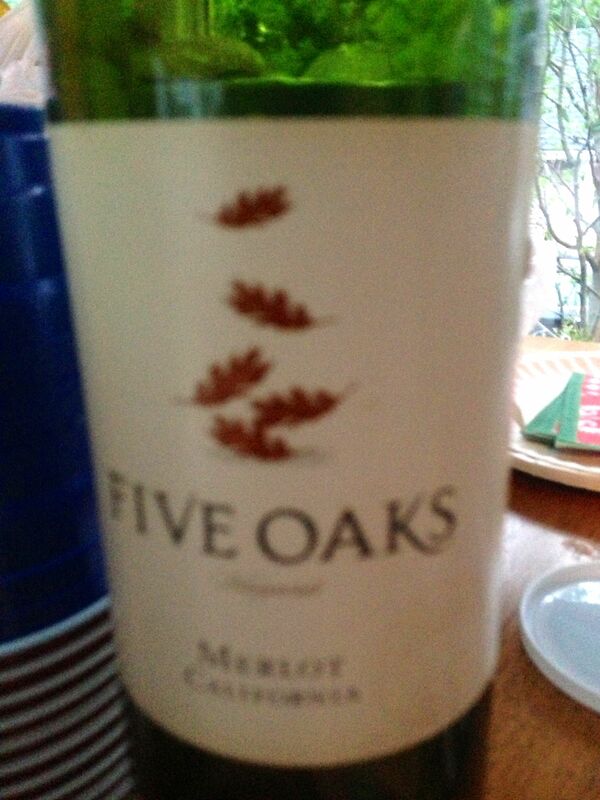 But the Five Oaks, produced by the Gallo Family Vineyards, was pretty solid. Not spectacular, but functional. Polished it off last night at the neighborhood poker game. Not sure I’d buy one for us…it’s not the bold adventurous choice…but it is a safe bet that will ruffle no feathers. This entry was posted in Merlot and tagged Sonoma, USA.